Leslie Farrell, age 71 of Kalamazoo passed away on January 25, 2019 with family at her side. She was preceded in death by her mother, Patricia Winnick and is survived by her daughter, Paige Farrell. Leslie made friends everywhere she went. She had an infectious smile and a joyful laugh -- she always approached life with a glass half full mindset. 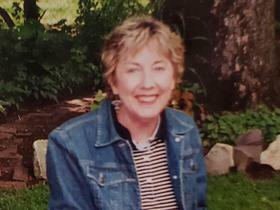 She was an avid reader and puzzle player -- crosswords and sudoku among her favorites. She loved dogs; always adopting a rescue when it was time for a new furry family member. Leslie always enjoyed catching up with family and friends over a glass of wine. Please join us in a celebration of life gathering on Saturday March 16, 2019 at Martell's from 12:30pm-2:30pm (3501 Greenleaf Blvd, Kalamazoo MI 49008).